The Pic des Trois Evêchés from the Col du Lauteret runs parallel to the very popular Pic Blanc ski tour from the same start point. In many ways, it feels like a longer version of that route. Both tours take you north-east from the start point along a sunny valley with the peak at its head. Both are bounded by a low ridge to the left and a higher one to the right. Both culminate in a steep face to reach the top, and both are very pleasant excursions from a high start point. This route is a little less popular than its shorter partner, perhaps because of the extra distance and extra height gain. 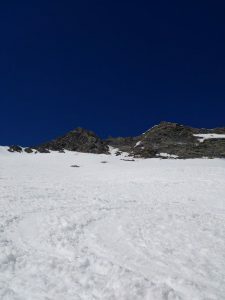 It is also a little less satisfying because it is not possible to ski from the summit. 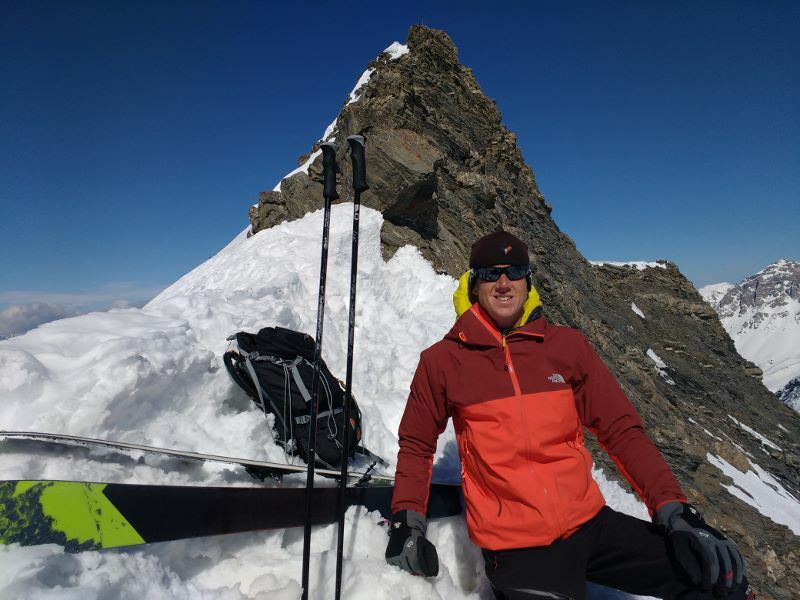 Even reaching the summit is difficult with only ski touring gear – a rope is recommended and the rock is loose. 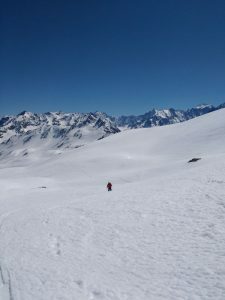 Most parties stop at the col to the south of the summit, and only a few metres lower. The lack of crowds can lead to better snow – last time I climbed Pic Blanc there were moguls on the way down and I counted over 50 other people on the route. Climbing Pic des Trois Eveches on a sunny April day we only saw a handful of other skiers. The weather was cold for April, and we set of quite late to give the snow a chance to transform. 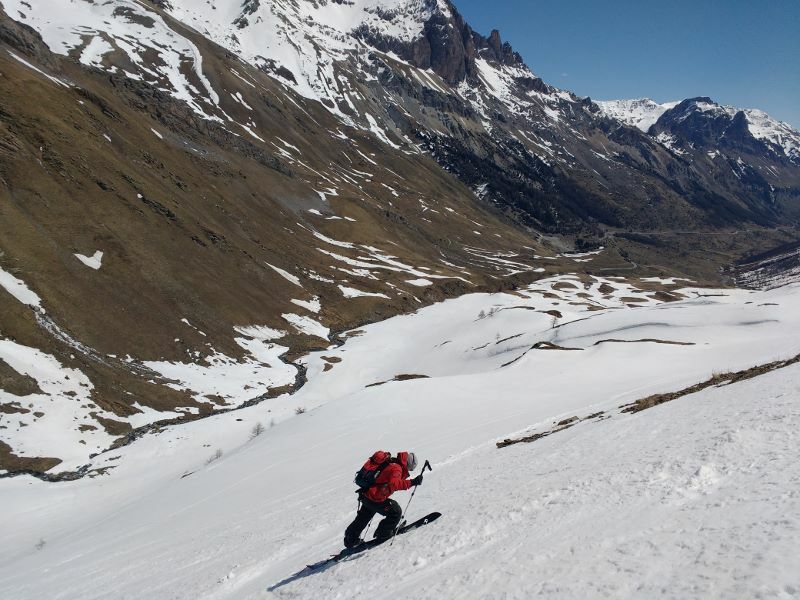 The other parties on the route were well ahead of us, having set off early as ski tourers like to do. Their descent was largely on a hard icy surface, while ours was largely on good spring snow in the afternoon. We parked on the Briançon side of the Lauteret, just after the first paravalanche, and climbed a grassy bank to reach the snow. 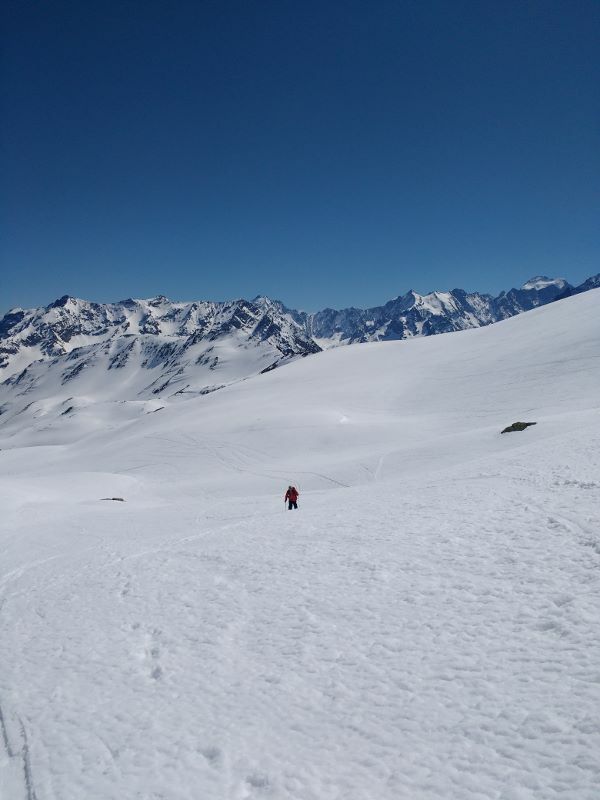 The normal route follows the valley bottom, close to the Torrent de Roche Noire, but we climbed leftwards to reach the Col du Galibier road as we were uncertain weather there would be enough snow close to the river. From the bridge where road and river cross we continued north westerly along the valley. The valley widens here and the terrain becomes quite rolling and interesting. There are a few options and we headed left, taking the longer, flatter route where the snow looked better. There is a large flat area before the final steeper face, filled with low rolling ridges. From here it is difficult to work out which of the rocky peaks is the true summit. The highest point is the left hand top as you look up from the approach, and the closest skiable point to it is the snowy col to the left. 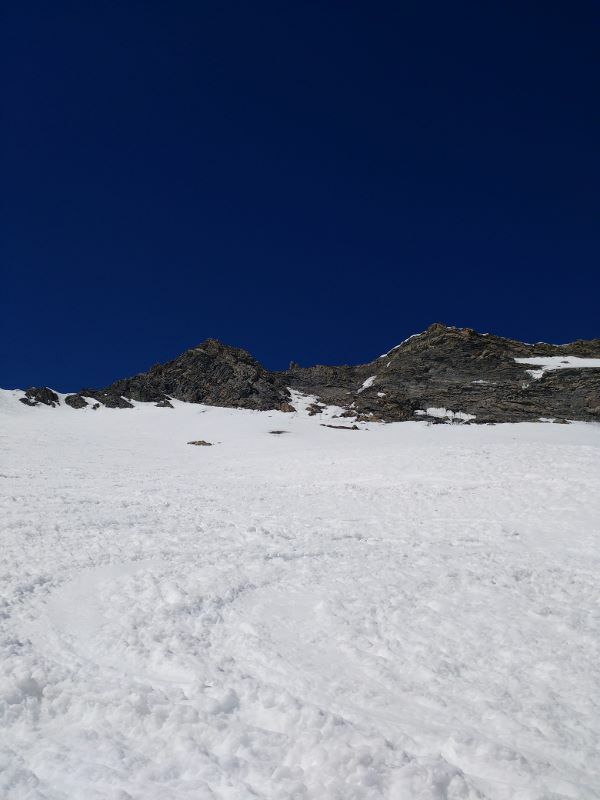 The face below the col is a bit of a slog, and we ended up boot-packing for the last hundred metres or so. 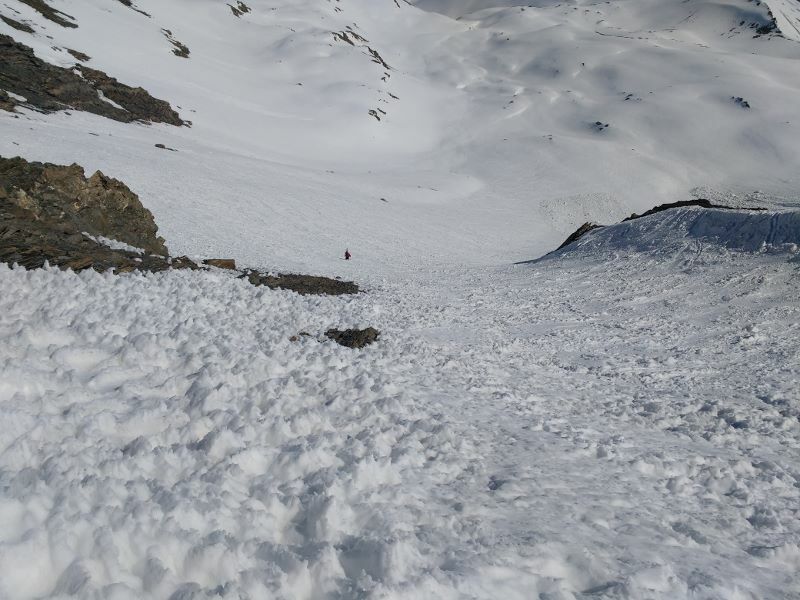 It was not that nice to ski down either, as old tracks and avalanche rubble had churned up the surface, even though though it was softening. It would have felt like a retreat to turn back before the col though. After this face, the skiing became much nicer. The surface was smoother and had softened nicely. There was a rippled texture from wind followed by freeze-thaw cycles over the previous days, but it was nice to ski all the way back to the bridge. After the bridge, the snow was in the shade and stayed firm all day. 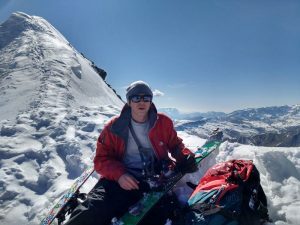 This is a lovely ski tour with options for different snow conditions – with more snow we could have followed the river all the way. With less snow we could have followed the Galibier road all the way from the Lauteret (but this route is quite susceptible to avalanche risk). 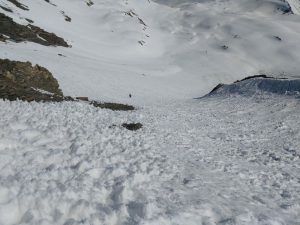 It can be done at all times of the winter and spring, as long as the snow is reasonably stable, although it is not recommended in poor visibility.